Brett Moffitt had reason to celebrate after Friday’s Truck Series race in Arizona. 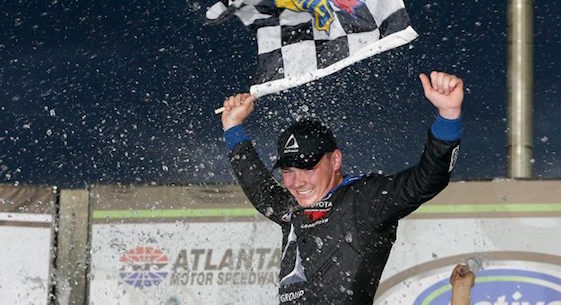 Brett Moffitt clinched his spot in the NASCAR Camping World Truck Series Championship 4 with a victory Friday night at ISM Raceway near Phoenix. Moffitt pulled away after a late restart to win his fifth race of the season by .456 seconds over Noah Gragson, who qualified for the Championship 4 on points. “I wasn’t sure if I wanted a caution to come out or not, but in hindsight I did,” Moffitt said. “Where we were sitting we were locked into Homestead mathematically. When that caution came out, I was kind of nervous. I didn’t know what was going to happen. Then when the 18 (Gragson) took the top (lane for the restart), I really didn’t know what the hell was going to happen. Toyota drivers Moffitt and Gragson joined GMS Racing teammates Johnny Sauter and Justin Haley in the Championship 4. Sauter had qualified with a win at Martinsville, and Haley earned his spot with a victory at Texas. (5) Brett Moffitt (P), Toyota, 150. (1) Noah Gragson (P), Toyota, 150. (3) Harrison Burton, Toyota, 150. (12) Grant Enfinger (P), Ford, 150. (4) Stewart Friesen, Chevrolet, 150. (15) Tyler Ankrum, Toyota, 150. (14) Johnny Sauter (P), Chevrolet, 150. (8) Derek Kraus, Toyota, 150. (11) Christian Eckes, Toyota, 150. (16) Sheldon Creed, Chevrolet, 150. (9) Matt Crafton (P), Ford, 150. (6) Ben Rhodes, Ford, 150. (19) Chase Purdy, Chevrolet, 150. (13) Tyler Dippel, Chevrolet, 150. (18) Riley Herbst, Toyota, 150. (29) Dawson Cram, Chevrolet, 150. (10) Todd Gilliland #, Toyota, 150. (21) Tanner Thorson, Chevrolet, 150. (22) Austin Wayne Self, Chevrolet, 150. (24) Stefan Parsons, Chevrolet, 148. (30) D J Kennington, Chevrolet, 148. (17) Myatt Snider #, Ford, 147. (25) Jordan Anderson, Chevrolet, 147. (27) Justin Fontaine #, Chevrolet, 147. (26) Landon Huffman, Chevrolet, 146. (28) Jason White, Chevrolet, 143. (32) Jesse Iwuji, Chevrolet, 138. (2) Justin Haley (P), Chevrolet, Oil Leak, 131. (7) John Hunter Nemechek(i), Chevrolet, Suspension, 128. (20) Austin Hill, Chevrolet, Engine, 57. (31) Jennifer Jo Cobb, Chevrolet, Header, 30. (23) Joe Nemechek, Chevrolet, Electrical, 11. Average Speed of Race Winner: 95.004 mph. Time of Race: 1 Hrs, 34 Mins, 44 Secs. Margin of Victory: 0.456 Seconds. Caution Flags: 5 for 33 laps. Lap Leaders: N. Gragson (P) 1-32;B. Moffitt (P) 33-48;H. Burton 49-94;M. Crafton (P) 95;J. Nemechek(i) 96-126;G. Enfinger (P) 127-135;N. Gragson (P) 136-146;G. Enfinger (P) 147;B. Moffitt (P) 148-150. Leaders Summary (Driver, Times Lead, Laps Led): Harrison Burton 1 time for 46 laps; Noah Gragson (P) 2 times for 43 laps; John Hunter Nemechek(i) 1 time for 31 laps; Brett Moffitt (P) 2 times for 19 laps; Grant Enfinger (P) 2 times for 10 laps; Matt Crafton (P) 1 time for 1 lap.